(Nanowerk News) Two SDSU engineering researchers are using biochar, an inexpensive carbon-rich material and a new method of creating the porous surface needed to capture electricity to reduce the cost of supercapacitors (Journal of Power Sources, "Biochar activated by oxygen plasma for supercapacitors"). The ability to absorb and discharge energy quickly make supercapacitors an integral part of energy harvesting systems, such as the regenerative braking systems of hybrid vehicles, according to explainthatstuff.com. However, supercapacitors are expensive. About half the materials cost comes from the use of activated carbon to coat the electrodes. Supercapacitor-grade activated carbon can cost $15 per kilogram. 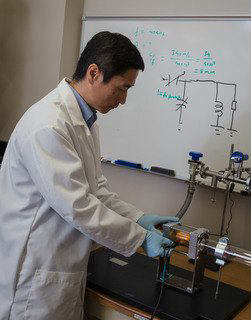 Associate professor Qi Hua Fan uses plasma etching to active the biochar. Associate professor Zhengrong Gu of agricultural and biosystems engineering uses the activated biochar to make supercapacitors. Biochar is a byproduct of the pyrolysis process that turns plant materials into biofuel. Qi Hua Fan, associate professor of electrical engineering and computer science, is developing new electro-optical materials using this plasma processing equipment. “Raw biochar needs activation to create the porous structure needed to trap ions,” explained Fan. Traditional chemical activation requires a high temperature, in the range of 1,700 Fahrenheit for two hours, and a chemical catalyst, followed by chemical washing and prolonged drying. This makes it an energy-intensive, time-consuming process. The charcoal-like biochar can be made from crop residue, such as corn stover, wood or even dried distillers grain with solubles, known as DDGS. However, for this research, Fan used commercially available biochar made from yellow pine. Several research groups had analyzed the specific capacitance and performance of this type of biochar, he explained, “so we had a baseline.” In addition, a company could supply the quantities of biochar necessary to make sure that test results were repeatable. To do the plasma etching, oxygen was used and excited by radio frequency through a dielectric barrier discharge. Fan then gave the activated biochar to Gu, who made the supercapacitors. The research was supported by a five-month, proof-of-concept grant from the North Central Regional Sun Grant Center. Two graduate students worked on the project. When the researchers compared capacitor performance, they found that those made using plasma treatment had 1.7 times higher specific capacitance, 171.4 Farads, compared to 99.5 Farads using chemical activation. “That’s a big improvement,” Fan pointed out. In addition, oxygen plasma-activated capacitors had lower estimated resistance, 3.3 ohms, as opposed to 14.5 ohms for chemically treated capacitors. This was attributed to the ions having easier access to the micropores and mesopores created by plasma processing. And, Fan added, “Yellow pine is not the best biochar for supercapacitors.” He expects a similar improvement in performance using biochar derived from other types of biomass. Fan has filed a patent application for the plasma activation process he developed. The next step will be to apply for funding to expand this promising processing technique for other types of biochar. “No matter what kind of parameters we eventually end up with, this will be very efficient,” he added.